In boils when there is much swelling and redness, Bell. is the first remedy to be used in the early stages. Boils recurring in the spring also indicates the remedy. The parts swell rapidly, become bright red and there is intense throbbing which is painful, pus develops speedily, the swelling increases and the redness radiates. Boil is very sensitive to touch. Sharp, throbbing, sticking pains and chills. Hepar Sulph is given after Bell. When the patient feels chilly and there is throbbing in the boil or sharp, sticking pain, which are worse at night and from cold. In boils and abscesses where suppuration is inevitable, Hep. Sul. is given in low potency, it hastens suppuration and heals quickly. But if given in high potency (above 200) it aborts the abscess. Patient cannot bear to be uncovered, wants to be wrapped up warmly and relieved by hot application. If cold relieves Merc. Sol. Merc. sol. is one of our good remedies for boils. It is generally given after Bell. When Bell is insufficient to check the inflammatory action. It comes in after Bell. When pus has formed. Like Help. sul. it also in low potencies hastens suppuration. High potencies abort suppuration. Pus is greenish in tint and quite thin and fluid. There is intense, shining redness with throbbing and stinging pains. It should not be given before or after Silicea. Silicea controls the suppurative process. It is useful where the suppuration continues and wound refuses to heal. In Silicea pus is thin, watery (less commonly thick) and offensive and often mixed with blood. Warmth is very grateful to the Silicea patient. S. is useful where the suppuration seems to continue indefinitely. It comes in after Silicea. S. is indicated in suppurative process when pus has found a vent and is discharging. Pus is thick, yellow, lumpy, bloody. S. like cold whereas Hep. sul. likes warmth. Carbo veg. is useful when boils become gangrenous, with burning pains like Arsenic Album but without the extreme restlessness. Arsenic is useful when there are cutting, lancinating, burning pains and extreme restlessness. Crops of boils all over the body, begin with soreness and go on suppuration and are followed by another crop. 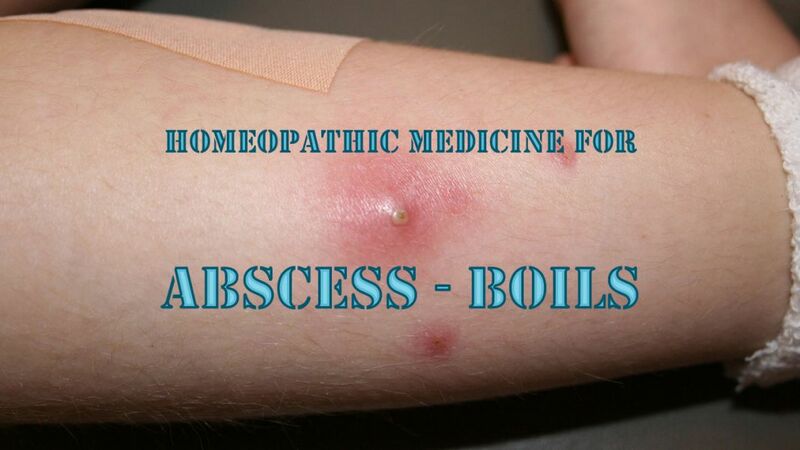 It is also useful where abscesses and boils do not mature, they shrivel up, then another crop comes. Boils coming in crops call for Arnica. Boils are very sore, purplish in color.